Herbs have a variety of uses including culinary, medicinal, and in some cases, spiritual. General usage of the term “herb” differs between culinary herbs and medicinal herbs; in medicinal or spiritual use, any parts of the plant might be considered as “herbs”, including leaves, roots, flowers, seeds, root bark, inner bark (and cambium), resin and pericarp. The word “herb” is pronounced /hɜːrb/ in Commonwealth English, but /ɜːrb/ is common among North American English speakers and those from other regions where h-dropping occurs. In botany, the word “herb” is used as a synonym for “herbaceous plant“. In botany, the term herb refers to a herbaceous plant, defined as a small, seed-bearing plant without a woody stem in which all aerial parts (i.e. above ground) die back to the ground at the end of each growing season. Usually the term refers to perennials, although herbaceous plants can also be annuals (where the plant dies at the end of the growing season and grows back from seed next year), or biennials. This term is in contrast to shrubs and trees which possess a woody stem. Shrubs and trees are also defined in terms of size, where shrubs are less than 10 meters tall, and trees may grow over 10 meters. The word herbaceous is derived from Latin herbāceus meaning “grassy”, from herba “grass, herb”. Emperor Charlemagne (742-814) compiled a list of 74 different herbs that were to be planted in his gardens. 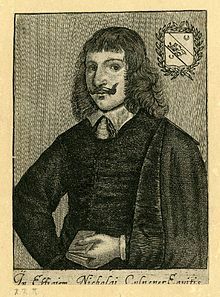 The connection between herbs and health is important already in the European Middle Ages–The Forme of Cury (that is, “cookery”) promotes extensive use of herbs, including in salads, and claims in its preface “the assent and advisement of the masters of physic and philosophy in the King’s Court”. Some herbs can be infused in boiling water to make herbal teas (also termed tisanes). Typically the dried leaves, flowers or seeds are used, or fresh herbs are used. Herbal teas tend to made from aromatic herbs, may not contain tannins or caffeine, and are not typically mixed with milk. Common examples include chamomile tea, or Mint tea. Some plants contain phytochemicals that have effects on the body. There may be some effects when consumed in the small levels that typify culinary “spicing”, and some herbs are toxic in larger quantities. For instance, some types of herbal extract, such as the extract of St. John’s-wort (Hypericum perforatum) or of kava (Piper methysticum) can be used for medical purposes to relieve depression and stress. However, large amounts of these herbs may lead to toxic overload that may involve complications, some of a serious nature, and should be used with caution. Complications can also arise when being taken with some prescription medicines. Herbs are used in many religions. During the monastic era, monks would cultivate herbs alongside vegetables, while others would be set aside in medicinal herb garden for specific purposes. 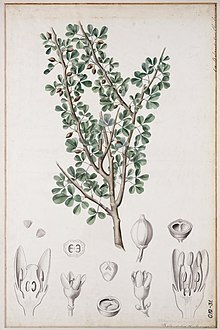 For example, myrrh (Commiphora myrrha) and frankincense (Boswellia species) in Hellenistic religion, the nine herbs charm in Anglo-Saxon paganism, neem (Azadirachta indica) leaves, bael (Aegele marmelos) leaves, holy basil or tulsi (Ocimum tenuiflorum), turmeric or “haldi” (Curcuma longa), cannabis in Hinduism, and white sage in Wicca. Rastafari also consider cannabis to be a holy plant. ^ “Herb”. Cambridge Advanced Learners’ Dictionary & Thesaurus. Cambridge University Press. ^ a b c d e f g The Royal Horticultural Society encyclopedia of gardening (2nd ed.). Dorling Kindersley. pp. 404, 679. ISBN 9781405303538. ^ a b c Bremness, Lesley. The complete book of herbs. Viking Studio Books. p. 8. ISBN 9780140238020. ^ a b Tapsell LC, Hemphill I, Cobiac L, Sullivan DR, Fenech M, Patch CS, Roodenrys S, Keogh JB, Clifton PM, Williams PG, Fazio VA, Inge KE (2006). “Health benefits of herbs and spices: The past, the present, the future”. Medical Journal of Australia. 185 (4): S1–S24. ^ Dillehay T, Rossen J, Ugent D, Karathanasis A, Vásquez V, Netherly P (2010). “Early Holocene coca chewing in northern Peru”. Antiquity. 84 (326): 939–953. doi:10.1017/S0003598X00067004.